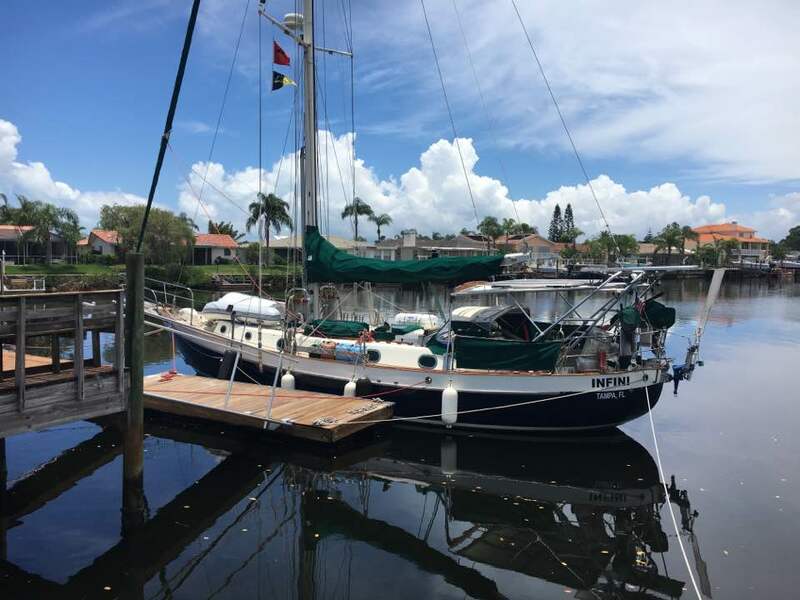 Michael and Susan left Florida in April 2007 aboard their Westsail 43 INFINI to fullfill a dream of full time cruising. They completed their circumnavigation in June 2017. It's finally out, folks! The paperback version of Your Offshore Doctor - A Manual of Medical Emergency at Sea, Revised Edition is available on Amazon! If you order, please ensure it's the revised version, published Nov 5, 2017, and not the older (ancient) version that Amazon still carries. The Amazon link is https://www.amazon.com/dp/1979580871/ref=sr_1_2… If the link doesn't work, just go to Amazon.com and type in the title of the book. Thanks, and safe sailing! Btw, the eBook version is also available if preferred. Your Offshore Doctor: A Manual of Medical Self-Sufficiency at Sea Paperback – November 5, 2017 by Dr. Michael H. Beilan (Author) 5.0 out of 5 stars 2 customer reviews See all 8 formats and editions Kindle Unlimited eBook $9.99 Paperback $14.95 Aboard a sailboat or power vessel at sea, professional medical care is often unavailable. A crew member must act as the ship's physician and this manual describes in a step-by-step format how to evaluate an illness or injury and proceed with appropriate treatment. A variety of situations is discussed, including first aid, CPR, burns, fish poisoning, chest and abdominal pain and extremity trauma. A chapter on Procedures illustrates various medical techniques. This updated, third edition of Your Offshore Doctor also has sections about mosquito-borne illnesses such as malaria, chikungunya, and dengue, as well as a discussion about how to stay healthy and maintain fitness. Popular in previous editions, there is an updated, revised list of the contents of a comprehensive medical kit as well as an explanation of adult dosages of common medications. Dr. Beilan is a knowledgeable cruiser who in 2017 completed a 10 year circumnavigation aboard his 43' sailing vessel and has years of experience both afloat and as an Emergency and Primary Care Physician. Pos:N28deg13.83min/W082deg45.11min. We've been very fortunate coming up the west coast of Florida. The weather (once again) has been unstable, a very common summer-time occurrence here in Florida. Many thunderstorms and lightning were seen in the distance, but none threatened us and we had an uneventful motorsail to Anclote Island (Tarpon Springs) on a beautiful, clear night, our last for this passage, in 5-8 knots of breeze and smooth water. We have to play the tides going into our channel where we live in Gulf Harbors (New Port Richey) as the water in the channel is just inches under our keel as we transit. At least that's the theory. It's easy to hit bottom around here, but this afternoon there was no drama, and we even had a friend come out in her runabout to accompany us in as a surprise. Thanks, Virginia! There were a group of folks waiting at our dock who graciously took our lines and help tie us up, and the party began. 6-12 Boot Key; Back in the USA! Pos: N24deg41.19min / W081deg07.40min. Infini is back on US soil after a ten year hiatus! We're anchored in 10' sand at Boot Key (Marathon) after a benign crossing of the Gulf Stream. As we have so often found, the weather predictions and what we experience are two different things. From West End, Bahamas, the forecast was for E-ESE wind 10-15 knots. That didn't happen. We ended up motoring with about 5 knots of wind directly behind us - yuck. Furthermore, the extended forecast wasn't promising at all, which is why we departed when we did. To summarize, the Gulf Stream was relatively OK, but there were many squalls around. During much of this passage the wind forgot to show up and when it did, was about 10 knots from astern, not enough to get us where we wanted to go in any sort of a timely fashion. We did, however, set the pole across the Great Bahama Bank from the NW Channel Light (which, btw, is out) to South Riding Rock, and had a few hours (6) of very nice wing and wing sailing. Eventually, we did our trawler imitation and Mr. Perkins was called upon; we ended up motorsailing most of the way here. As I said, it was either that or wait for who knows how long to get favorable wind conditions. Some passages are like that. Predictions and reality: two different things, especially when it comes to the weather. Lest anyone think this is a weather rant, (OK, so I'm a bit tired...) in spite of all this, Team Infini is happy to be back! Pos: N25deg01.5min / W077deg33.9min. Yesterday, we anchored at Norman's Cay in the cut. The current rips thru here so a good anchor set is mandatory. There was lots of construction going on at the entrance; we're not sure what's being planned. This afternoon we've anchored at West Bay towards the outside near Goulding Cay, staging for a midnight departure for the NW Channel Light. From there, our route is to South Riding Rock in the daylight, then across the Gulf Stream to Florida. Depending on the weather, we'll either enter Hawk Channel towards Alligator Reef or go straight to Moser Channel at Marathon. Stay tuned. We haven't gotten off the boat to go exploring the past few days, so nothing more to report. Pos: N24deg10.71min / W076deg26.73min. This morning was a very special one for us. In June 2000 we visited Staniel Cay aboard Infini and today we once again anchored east of Thunderball Grotto, effectively completing our circumnavigation. Whodathunk? It's been ten years and two months since we left Florida and started cruising and living aboard full time. We didn't set off with a circumnavigation as our goal. Rather, we took baby steps, stopping to enjoy the people we met and the places we visited along the way, and think that only two factors chased us around the world: visas and weather. Visas of the country we were in dictated our length of stay there, and the prevailing and predicted weather conditions dictated our destinations and anchorages. We feel really blessed to have been able to accomplish what we've done safely and in good health, and give thanks to God and our family and friends for the many privileges that have been bestowed upon us. Of course, having a solid working platform such as Infini, our Westsail 43, was a prerequisite for the type of passage making we've done. She's been more than capable and a steady hand throughout. For any prospective cruisers reading this, we hope our blog has been of benefit in its descriptions and information. It's been lots of fun to write as its evolved, and it's enriched our lives as well as we strive to impart information we feel will be of benefit to others, as well as providing a bit of entertainment. We've had a blast along the way and are glad many others have vicariously come along for the ride. Our thanks to all and we'll continue posting as we travel north to Florida, and will also update our picture albums when we get back. BTW, in case you're wondering, to celebrate we went to the Staniel Cay Yacht Club and hoisted a few. We also enjoyed some conch fritters, fish tacos and a mahi sandwich. All good, and big smiles all around. Pos: N24deg05.92min / W076deg24.20min. We departed at 0615 and motor-sailed the 50+ miles to Black Point, Great Guana Cay. It was either motor or stay in Georgetown another week, as a trough is hanging around for the next 5 days or so suppressing the wind. We were ready to go, so made the best of it and ignored the motor sound. Some days are like that. Tomorrow we'll find the laundromat, reputed to be one of the most reasonably priced ones in the Bahamas. After, we'll head the 8 miles to Staniel Cay to seek protection from the expected west winds coming in when that trough arrives, bringing rain and possibly thunderstorms (we hope not). Well, the kids are gone. Before departure late this afternoon, Ty & Hanne had a chance to snorkel with "Nicki" again. Nicki was named by some cruiser for the nicks on her dorsal fin. She and her baby hung around Infini for a few hours, obviously looking for attention. In the spirit of visiting somewhere and only leaving our footprints, T, H and myself did a bit of a take-off on that theme and used small rocks to form our name as a momento, located below the Monument on Stocking Island. Cruisers have left their signatures this way for a long time. Just before sunset we stored the dinghy and prepared for departure. Georgetown has been a great stop, but it's time to get on up the road. Ashore: svinfini at gmail dot com.